Getting ready to organize your tree planting project? We’ve got a quick checklist to help keep you on track. 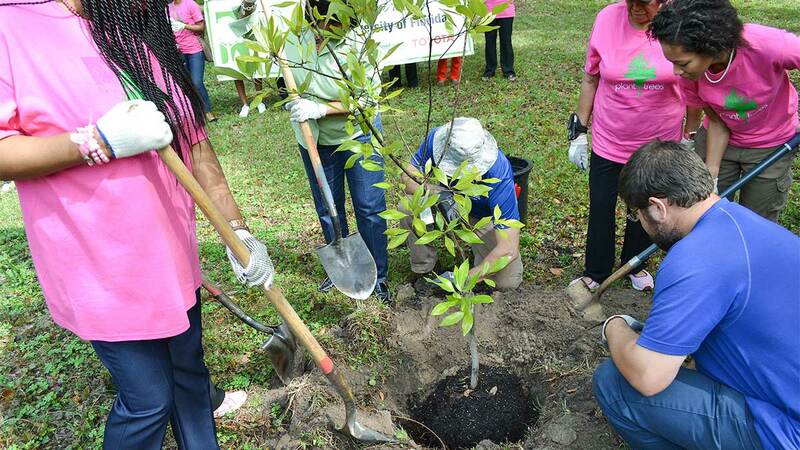 Choose the type of tree planting project you’d like to organize. Some possibilities include an Arbor Day celebration, memorial tree planting, commemorative tree planting, street tree planting, park tree planting, community entrance planting, seedling giveaway, street tree inventory, etc. Decide who needs to be involved. Think about who you will need permission from and who you can get support from. Organize a planning committee and set a date for the event. Choose the planting site and species and get all necessary permits. Be sure to think about planting the right tree in the right place—considering hardiness zones, size, soil conditions, etc. Hold a fundraising event, ask for support from community leaders and businesses and look into the potential for grant funds. Get the media involved, visit area service/youth/church organizations and appeal to employees of larger organizations. Complete this task approximately 3 months in advance and work with a reputable nursery. Try to get them to run a story about the event before it happens and cover the event for a story after you’re finished. Create a schedule for the day. Make sure everything is ready to go on planting day. Instruct participants and demonstrate proper planting. Step-by-step directions can be found here. Schedule routine maintenance and care. If you won’t be the one caring for the tree, make sure these arrangements are set up before the event. Reward volunteers and other who helped. Gather your committee members and volunteers to see what worked well and what didn’t.